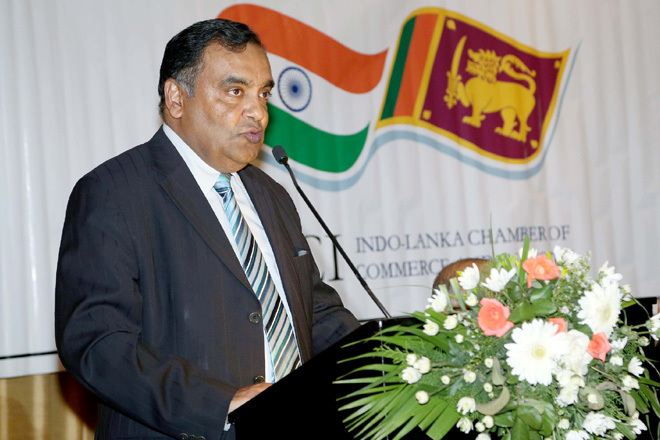 Aug 04, 2016 (LBO) – India’s High Commissioner in Sri Lanka Y. K. Sinha says that the first round of negotiations on the Indo-Sri Lanka Economic and Technology Cooperation Framework Agreement (ETCA) will start shortly. Speaking at the eighth AGM of the Indo Lanka Chamber of Commerce, the High Commissioner reassured that India was aware that greater economic integration requires moving in an asymmetric manner. “India was prepared to move at a pace which Sri Lanka is comfortable with and address Sri Lankan concerns as well as take measures to facilitate Sri Lankan exports to India,” Sinha said. High Commissioner highlighted that the agreement, proposed by Prime Minister Ranil Wickremesinghe would focus on sectors such as capacity building, technology, vocational training, IT and tourism, among others, which would immensely benefit Sri Lanka. Noting that India had attracted FDI amounting to 40 billion US dollars in 2015-16, High Commissioner stressed that Sri Lanka needed to take advantage of its proximity to India by linking into value chains and supply chains. Highlighting the new and transformative phase in India-Sri Lanka bilateral relations, High Commissioner stated that four high level bilateral visits took place within first 90 days of the formation of a new government in Sri Lanka in January 2015. The stream of high level visits had continued and enhanced bilateral economic and commercial engagement were an important agenda point in all these meetings. At the eighth AGM, the Group MD of Watawala Plantations, Vish Govindasamy was reelected as the President of the Indo Lanka Chamber of Commerce and Industry at its Annual General Meeting. Romesh David of transportation group of John Keells Holdings and Biju Jacob, country head of ICICI Bank were re-elected as the two Vice Presidents of the Chamber.